Gym MultiPurpose is especially designed for health sites, fitness blog, fashion and photography blog. 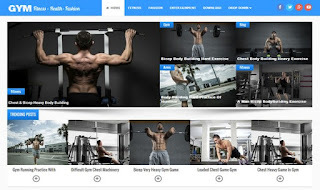 It is a one complete multipurpose fitness blogspot template suitable for multiple niches. A fully dynamic template that makes customization much easy for it's users. Totally work on drag and drop which means, it's admin panel provides bundles of features where you can customize it in any way to add or remove widgets from whole website. A very heavy magazine website can be easily created with gym template in no time. It gives a lot freedom to it's users when comes to customization. It is solely created for the purpose to build a one successful magazine or fitness fashion blog. It is ideal for Bodybuilders, bloggers, photographers, and writers to start a new blog from scratch.